As the holidays descend, craft and maker markets of all kinds are popping up around the East Bay as folks hunt down unique, locally made gifts. But often, these events tend to be dominated by white vendors. With that landscape in mind, Walker founded Make•Do, an event productions agency focused on elevating black female entrepreneurs. Her first event, a social media workshop, took place in April. Saturday, Dec. 2 marks the debut of Make•Do Market, which she hopes to organize twice a year. 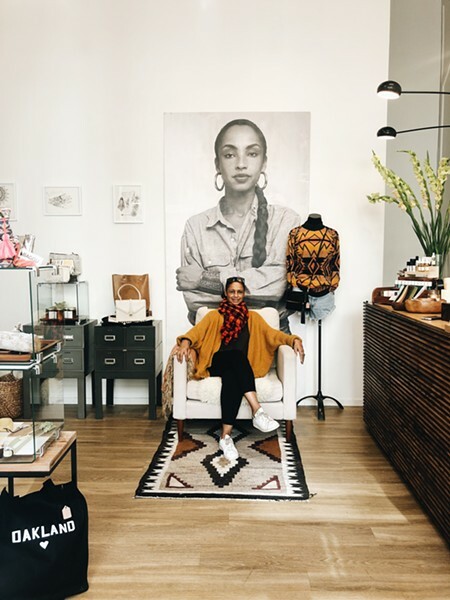 For the first edition, Walker focused on women with established brick-and-mortar boutiques and strong ties to the Oakland community, although some smaller brands make an appearance as well. Among the vendors are downtown concept shop Show & Tell, local clothing brand O.N.W., and natural beauty products boutique Concept Forty-Seven. Fuel up with a savory spread from Pleasure Principle Catering, pies from Two Chicks in the Mix, and vegan coconut ice cream from Kubé Nice Cream. “I want it to feel like someone curated a place where I can go and find gifts and holiday outfits all in one space and also be in a space full of black women and people interested in supporting black woman-owned businesses,” Walker said. Walker is a self-proclaimed serial entrepreneur who dabbled in selling clothes on Etsy, photography, and makeup work before landing in event production for nonprofits. The St. Louis native moved to Oakland two years ago, finding a city where she felt like she could finally launch Make•Do and organize her first market. “Coming here, feeling like there was just a strong sense of community and lots of culture, I could do something like Make•Do and not spend as much time explaining why it’s important,” she said. Make•Do Market: Saturday, Dec. 2, 4-10 p.m., VSCO HQ, 1500 Broadway, Oakland. Get free tickets at Make-Do.us.